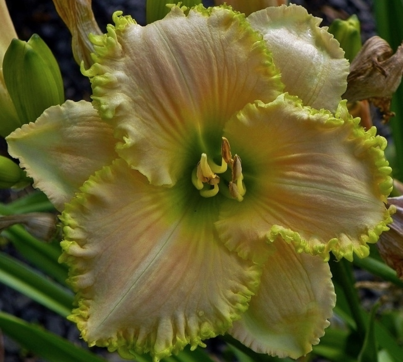 ​Welcome to the Rogers Gardens Daylilies, and we are proud to announce 9 new introductions for 2014. Quantities are limited on most, so order early for best selection. All are sold as single fans, and are priced at $100.00 each. You can purchase all 9 for $750.00, a savings of 150.00. Shipping will begin around mid April this year. Thanks for visiting and hope find something you like. 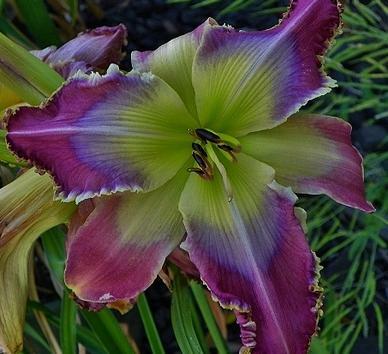 Marianna Atanassova is a large, 7 1/2 inch purple with a bluish-purple eye extending well into the petals and set off well by a greenish yellow throat repeated on the sepals. It appears very graceful despite its size atop 34 inch scapes and is a mid season bloomer. I have also found it an easier pod setter than many I have grown of this size and shape, so it might be useful in a u.f. program. Semi Evergreen. My first release from Dental Academy, Little Green Fingers is a 5 inch yellow to polychrome with a greenish yellow edge that extrudes into little hooks and claws even during cool nights. A mid season bloomer, it always seems to open up well for me appearing first thing each morning being an EMO unlike Dental Academy. 31 inch scapes and an evergreen. When it is on,Heaving Bodice is one of the most ruffled things I grow. 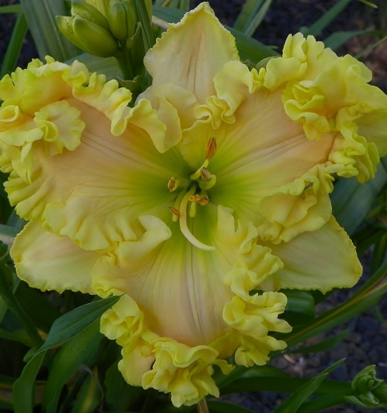 It does depend on nights that are warmer than my average nights, though, as it can hang up when nights are in the low 50's and is more yellow than pictured, but when nights are warmer and muggier, it becomes more of a polychrome and with extra ruffling. The 6 1/2 inch blossoms are set off nicely by a green throat appearing in the early midseason and on 31 inch scapes. Semi Evergreen. ​Grape Ambition is an extremely clear grape-purple with a subtle bluish-violet eye, producing its 6 inch blossoms in early to mid season. It always opens well, and when nights warm above the mid 50s, it develops a white edge, often with little white teeth. The 36 inch scapes appear well above the evergreen foliage, and this is a very consistent performer. 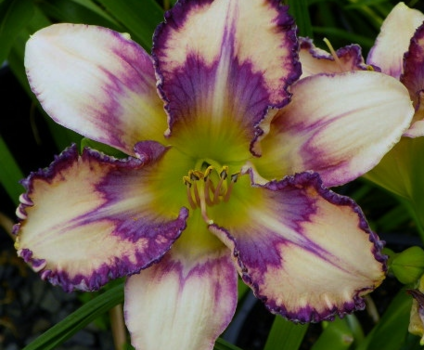 Exploding Desire produces narrow 7 inch mauve-purple blossoms with a blue-violet eye that radiates out from a greenish-yellow throat, and has a purple edge outlined in gold. As the weather warms, the gold edge produces various teeth and hooks. It has better than average bud count for me, is a semi-evergreen and produces 36 inch scapes. I usually get little in the way of rebloom here in Oregon due to our climate, but I had three sets of Blooms on Dragonfly Returns last season. 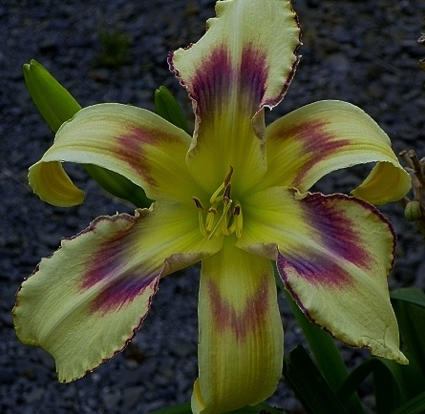 It is a narrow buff-yellow with a patterned eye ranging from blue-violet to red violet. 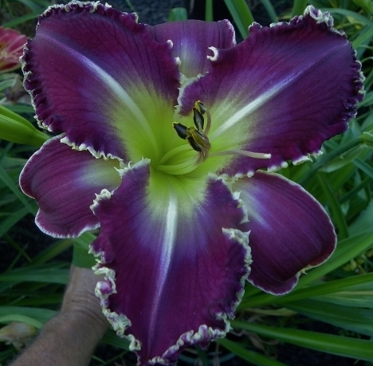 Early blooms can approach 9 inches at times, appearing on 29 inch scapes and have no problems opening up even as an early season opener. it is a full dormant so completely hardy. 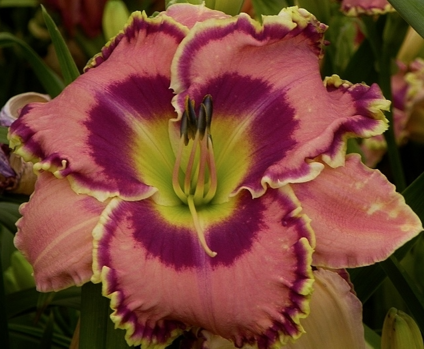 Denial Delta is 6 inch mauve-purple with a gold edge and a muted violet throat that becomes sculpted as temperatures warm. I usually don't see the sculpting until temps warm at least into the higher 50s, so wouldn't recommend this one for the very coldest areas, but this one might provide a useful hybridizing tool for those wishing to extend sculpting into colors other than yellows. The 36 inch scapes are held well above the foliage, and it blooms midseason. Evergreen. 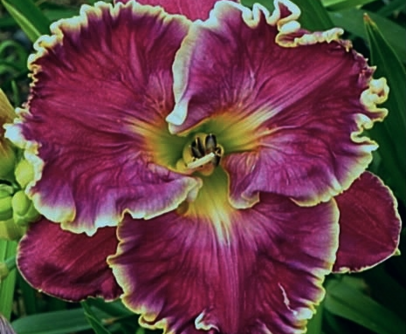 Ordering Information: All plants are single division unless stated otherwise. The height and bud counts are for bloom here during our typical weather and since I usually get far fewer buds here than advertised from southern plants, I would expect bud count to be higher where warmer. All plants are available individually, and this year I am offering a collection price of $750.00 for all 9, which represents an 150 dollar savings from the individual price. Every year about the time Damsel Fly opens, I have great hordes of the real thing flitting about, so the naming of this one seemed a natural. 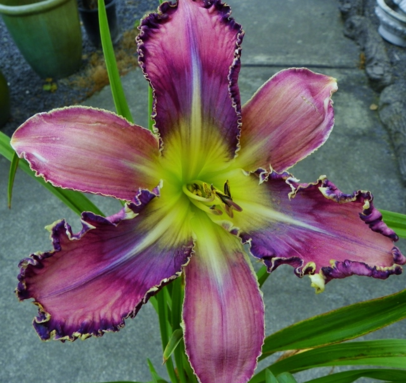 It is a 5 1/2 inch with a patterned blue-violet eye that explodes like a star upon the sepals as well. It is an early-midseason bloomer, with semi-evergreen foliage and 32 inches in height. Always True is a 6 inch mauve-pink with a clear and consistent double edge of purple and gold. It always opens well, and presents the same face day in and day out despite nights in the low 50's here during bloom season. Blooms are held well above the foliage at 32 inches, and being dormant, it should perform just as well in colder winter areas as it does here. Midseason.